We chose Linda and Cengiz over several other agents to handle the sale of our apartment in Altinkum as we got a really good honest feel from them. At all stages of the process they kept us informed, offered honest appraisal, helped with sorting out bills and gave all round excellent advice. When they found a buyer for the apartment they also offered excellent professionalism in the face of a complicated and, sometimes, difficult negotiation. Their willingness to put us first in all the complications made the process manageable and less stressful. At no time did we feel that they were unsure of the next step in a complicated process and even took extra time to help with a complicated banking arrangement. They handled the whole sale with clarity, professional expertise and also good humour! We have absolutely no reservation in recommending Linda Estates to you – you will not be disappointed! I would just like to say if anyone is thinking of selling their property in altinkum but like we were, are afraid of knowing what to do and who to trust well fear no more Linda estates was recommended to us by some close friends so we thought we would give them a try and I can assure you we were not disappointed this emlak is run by Linda and gengiz two of the nicest people you will ever meet they are very professional and helpful from start to finish and beyond always at the end of the phone at anytime I would recommend Linda estates 100% I would like to thank Linda and gengiz for everything they did and look upon them as friends now . Thank you for all your help with selling our property. You were very efficient and helpful every step of the way. You did all the necessary paperwork and dealt with everything and all we had to do was sign the documents for the sale. I would not hesitate to recommend Linda Estates to anyone buying/selling their property. of our motor scooter and would not take a any payment from us. Thank you both so much in helping us choose and purchase our Apartment in Altinkum.You have both been so professional in making our purchase go so smoothly and efficiently.Nothing was too much trouble,and you dealt with everything to make the process go so effortlessly we couldn't fault you.We would highly recommend you to anyone looking to buy in Altinkum.You are Genuine,Honest,and Professional Estate Agents. Gary and Joy from York. Hi Linda & Cengiz, Just a quick email to let you know that we had a safe journey home.Thank you for the speedy, efficient and professional way you handled the sale of our apartment.Selling a property in a foreign country is difficult anyway but when there is a language barrier as well the problems are compounded.Both of you made the process as simple and stress free as it could be.You had arranged as much as you could beforehand without us, so on the day all we had to do was 'sign on the dotted line'.Your knowledge of the language and understanding of the TAPU system was invaluable. We will definitely recommend you to any of our friends in Didim who are thinking of selling a property. Thank you both again. With our very best wishes. we sold our property through linda estates in November 2014,we found that linda & cengiz could not do enough for us,they were highly professionally,and very TRUSTWORTHY, everything went very smoothly,and the sale went through all in the same day,they looked after us the whole day from start to finish,we would recommend anyone selling or buying to go through Linda estates Josey&keith Liverpool. Would recommend Linda estates to anyone who are selling or buying a property. Linda & Cengiz kept us informed with the buyers movements from first offer to actual day of sale. Managed to do the sale in one day. Any problem on the day Cengiz is the man to get round them. Best wishes,Ian & Bev Cockram (Tamworth uk ). Linda and Cengiz are very reliable and efficient. They are also very friendly and go out of their way to help you. We would certainly use Linda Estates again and recommend them to others. We would like to thank you both for all of your help, support and hospitality given to us when buying our apartment through Linda Estates. You made the process stress-free and a pleasure to go through. You could not have done any more for us than you did. Both Stuart and I would strongly recommend you to anyone wishing to purchase or sell a property in Turkey. You both work so well together and give the process a personal touch. You kept us fully informed throughout, whether by email or telephone in England or face to face while we were in Turkey. All the hard work was undertaken by yourselves, organising translators, taking us to the relevant government offices for tax numbers and the signing over of deeds when required. We also thank you for arranging the transfer of utilities for us so that we could enjoy our holiday whilst you did the running around. We now look on you both as friends and will continue to keep in touch during our holidays in Turkey. Once again thank you from both of us for everything you have done, see you soon. LindaEstates provided an efficient, friendly and 'complete' property sale service. The marketing, viewings and negotiations were carried out promptly and effectively while we were in the UK and we were regularly informed of progress and procedures. On the day of completion everything went smoothly with minimal fuss and inconvenience. Cengiz and Linda provided a very personal service and addressed our specific concerns, needs and queries quickly and efficiently. We had a very professional service, which gave us great confidence in their ability to manage the sale effectively and for everything to progress smoothly. 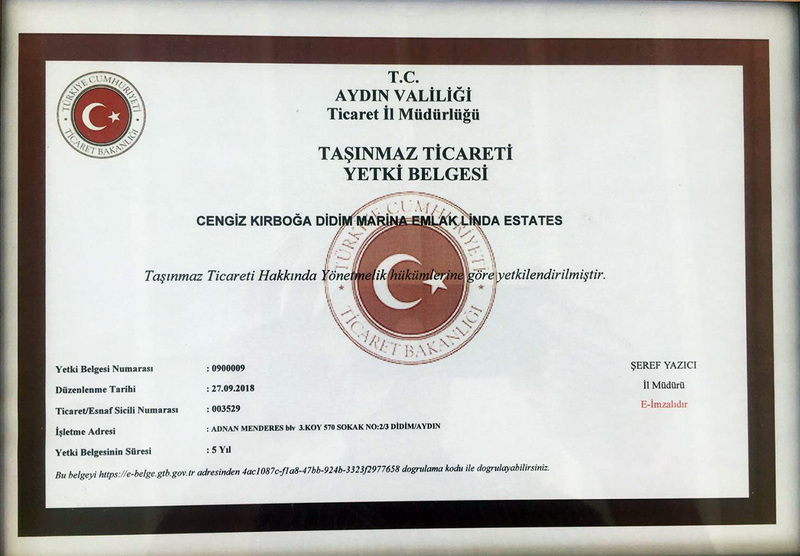 Our prior expectations of a stressful Turkish sale process were not founded due to the professional management of the sale process right from the start by Linda Estates. Being very happy with their service, we can recommend them to others. We would certainly use them again. We would like to recommend Linda and Cengiz of Didim Marina Emlak- Linda Estates, if you are looking to sell or buy a property in Altinkum. We went through the selling process with them and from the initial contact the advice they gave was highly informative and well detailed. As a seller this gave us great confidence and we knew we could rely on them to complete the process professionally. When we arrived Linda and Cengiz took us through everything step for step and explained the process thoroughly- this helps to remove any worries you may have and they really did take care of everything for us.. Doing the formalities was so much more straightforward than we expected and this was down to Linda and Cengiz. Although this is a business process they really do add a personal touch to it which makes all the difference.. Highly recommended if you're thinking about this process as they won't disappoint you. We would recommend Linda & Cengiz of Linda Estates / Didim Marina Emlak on the sale of your property. Is is good to know that they are one of the very honest, reliable and authorised estate agents that you can rely on in Altinkum. From the initial contact of the sale being made to the formalities being taken care of and the service provided whilst in Altinkum by Linda and Cengiz was second to none. If you are thinking of selling then consider Linda and Cengiz as you will not be disappointed. It is natural to worry about the money transaction being received but this was all taken away by them. Mike and Toni Walker, February 2012.
" We couldnt have had a better experience, not only do we now have a beautiful apartment but we also have 2 new friends for life. From viewing properties, to solicitors, utility bills, banks accounts and where to buy a fresh pint of milk we couldnt have asked for any more help and advice than Linda and Cengiz gave us. Also knowing that they are at the end of the phone should we need anything in England or Turkey makes us feel alot more at ease. Would not hesitate to recommend Linda Estates you will not find a better service or nicer people. We look forward to many drinks with our new friends in our new apartment. Missing you all already and can not wait to come back, we are really looking forward to our life in Turkey and getting to know you better. You have been so kind and helpful from start to finish, thank you for everything that you have done for us. You go so much further than just an estate agent from showing us around the area and to even helping us purchase furniture, how and where to pay the bills and shopping etc. You are always there at the end of the phone if ever we needed anything, i can not thank you enough for all that you have done. If there is ever anything that we can do for you　and your family,　then i hope you will ask us, as i would like to show you the same care and attention as you have shown to us. You have been there in a professional manner and through you help and support we have ended up being extremely good friends, which i hope will last for many years to come. Two and a half years ago we went on holiday to Altinkum, we enjoyed ourselves so much that we decided to go back in October to look for a property. We looked on the Internet and chose some areas to view, we looked at a lot of properties with different estate agents, some far too pushy and only interested in selling you any property, and in no way caring about our requirements, then we met Linda and Cengiz, they listened to what we wanted and found us properties that fitted our requirements and price range. They sorted out all our paperwork tapu and solicitors, and made the whole process run smoothly, we didn't have to worry about a thing. We now own a beautiful villa in Yesiltepe (Green Hills) just outside Altinkum, and are looking forward to early retirement in sunny Turkey. Thank you Linda and Cengiz for helping us to fulfil our dream. Linda and Cengiz Kirboga are estate agents and much more.They are friendly and effecient and take you through the whole procedure with the utmost confidence and something slightly daunting becomes easy,They are there giving advice even when the process is compleat,nothing is too much trouble for them and they have become good friends.They are happy to advise you on other things to do with your new home besides the buying process.All good. Thank you to Linda and Cengiz for helping us to sell our apartment in record time. They were both professional and friendly and realised our need to sell quickly. I would certainly recommend their agency to anyone. Linda and Cengiz were more than helpful when we bought our property in Altinkum. We never realised how many different offices we had to visit, but Linda and Cengiz were always available to run us around. We would never have found the different places by ourselves. Our transaction was completed without any hitches. Thank you Linda and Cengiz for all of your help. we are jean & bob mather from st helens merseyside.we purchased our villa in yesil tepe turkey through linda estates in july 2008.i would not hesitate to reccomend linda estates.linda and cengiz have been absolutly brilliant from start to finish.they helped with everything from applying for our milatry clearance to getting our tapu.their after sales service is second to none and are always happy to help.the have guided us through the legal system and even helped to sort out paying utility bills.they aways have time for us and have made it clear they will help with anything.we would not hesitate to reccomend linda estates. I would be so happy to recommend your estate agency to all the buyers from U.K,because your firm is only one in Turkey that looks after the buyers not only for best value but also the after sales service.You are only one who looks after the customers if any thing goes wrong.All your customers are your friends and because you are the friend in need,so are the friend in deed.